As all the talk on Sunday centered around the ceasefire in the trade war between the US and China, stocks are jumping on the news. At the time of writing, Dow futures were up around 1.91% and the Nasdaq was up 2.27% and still climbing. We are also entering a strong period of the year seasonally and the market is setting up well for a Santa Claus rally. Whether the rally attempt has legs we won’t know until later in the week, but if it does, we still want to be trading the strongest looking stocks. Looking very strong and has already recaptured the 50 day moving average. With a likely rally on Monday, this stock should pop up above the declining trendline which might see it have a run at the prior high of $150. 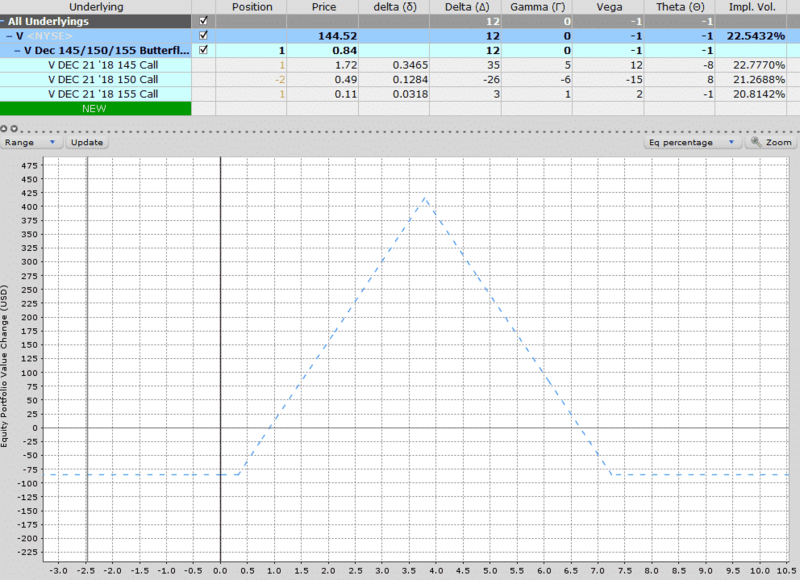 In this case, I like out-of-the-money call butterfly spreads as a really cheap way to gain some upside exposure. 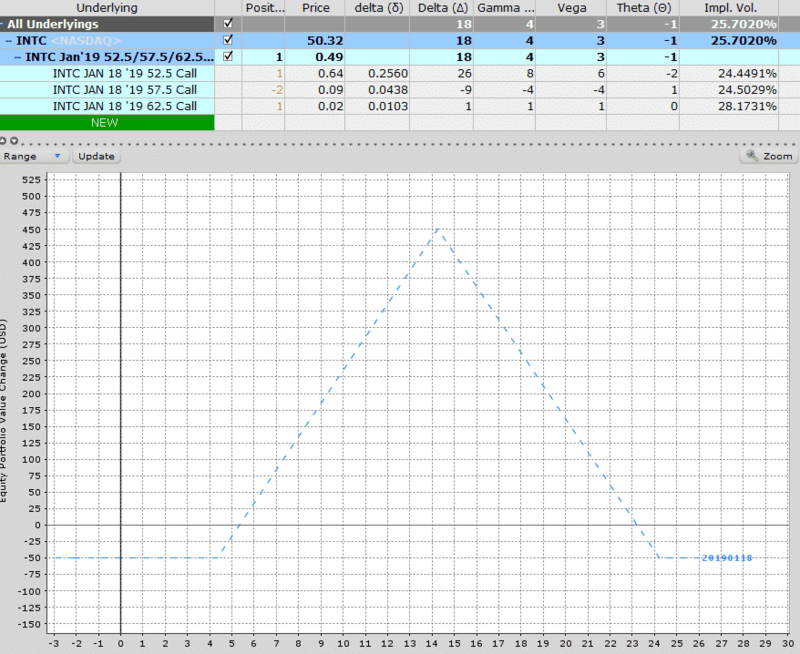 On Friday, the Dec 145-150-155 call butterfly could be bought for $85 with a maximum potential gain of $415. 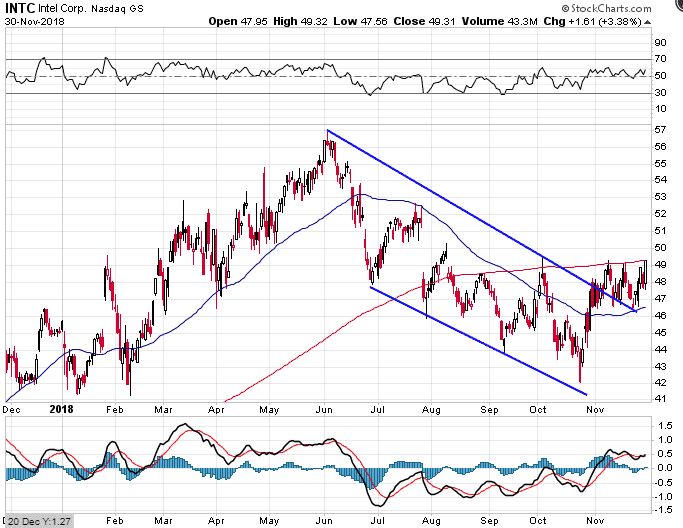 Intel is also looking really strong since a prolonged downtrend from June to late October. 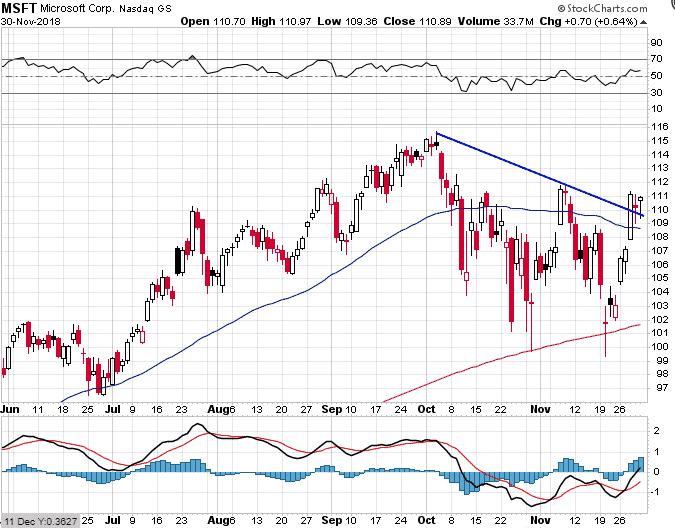 Intel has recently broken above the 50 day moving average and that level is holding as support. The average is now sloping upwards and with an expected rally on Monday, it should shoot up through the 200 day moving average. Could it also make a run at the high from June? 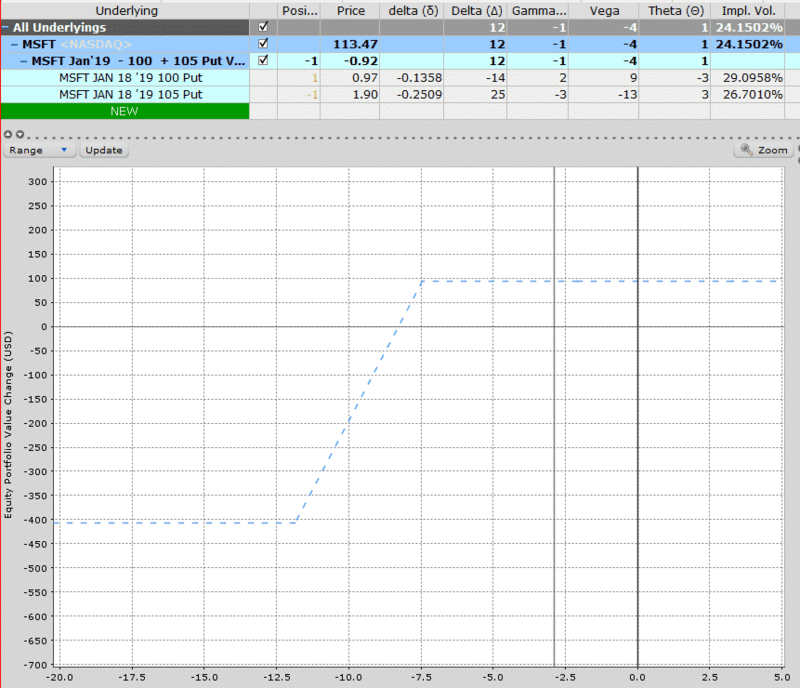 This butterfly spread for January expiry could have been purchased on Friday for only $50 with a $450 profit potential. The price will likely be higher on Monday and the stock needs a pretty big rally to finish in the middle of the profit zone. MSFT held on to the 200 day moving average perfectly during the recent selloff and is now back above the 200 and also broken above the short-term down trend line. A call butterfly could work here also or even a call ratio spread. So could a bull put spread with a stop loss just below the 50 day line. This bull put spread for January expiry could be sold for $90 on Friday with capital at risk of $410 for a potential 21.95% return in under two months. This trade also has a nice 7.5% margin for error on the downside, but a prudent stop loss could be place just under the 50 day moving average. It looks a foregone conclusion that the market will rally on Monday, but we don’t know if this is a resumption of the bull market or just a temporary bounce. One thing is for sure though, if I’m going to get long, I want to be looking to get long the strongest stocks in the market. That way, if I’m wrong and the market reverses later in the week, hopefully these strong stocks will hold up better than stocks that have been under a huge amount of pressure lately, like FB and NVDA. 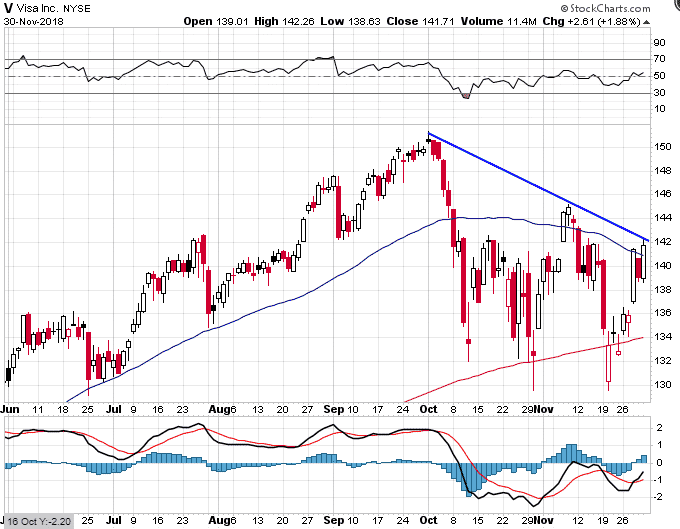 From a technical standpoint, I prefer to get long stocks that are above their key moving averages rather than below.